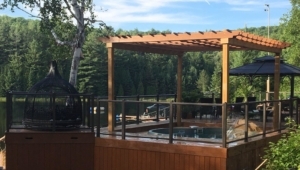 Home/Uncategorized/There’s a New Pool to Cool Off In at Footprints Resort Ontario ! View of pool and lake at Footprints Resort Ontario. Footprints Resort in Ontario now has a pool!! 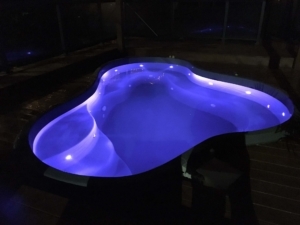 A cool, relaxing, conversation pool with plenty of room for all! We listened when some of our guests said they would prefer to cool off in a pool rather than our natural body of water. We still have the lake with it’s diving platform and slide, and the trampoline just off the long dock, all of which are in the deepest part of the lake (25 ft minimum depth) for a lazy afternoon of swimming and boating. But for those who just want a quick dip to cool off, it’s perfect! Located on the deck adjacent to the hot tub, it’s easy to take a dip just before preparing a meal or after a brisk hike. For those who enjoy a soak and a chat, it’s a social hub with seating around the entire perimeter and room for many bodies. It’s a great place on a hot afternoon or evening to cool off with a drink and chat with your sweetheart or other guests. Here’s a list of all other amenities available to our guests and to our FAQ to answer other questions you might have. Don’t forget to bring personal towels for the beach, lake, hot tub and pool and feel free to bring large, blow up floaters to lounge on the lake on if that’s your thing! And don’t forget, as always, no glass (drink glasses, beer bottles, etc) in or around the pool and hot tub please! So if you really prefer a pool to a lake, we’ve got you covered! Or cooled… at Footprints Resort in beautiful Hastings Highlands in Ontario!